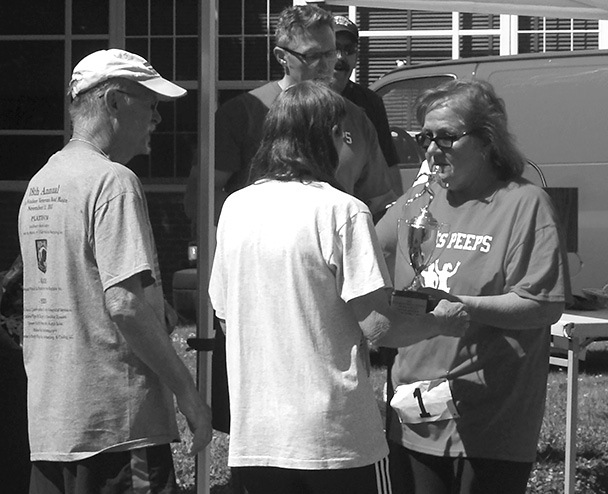 At the awards ceremony following the Firemen’s 5K Race, Nancy Simison presents the Healthy Spirit Award to Rich and Linda Bixler, veteran participants in the event. The award, and the race itself, memorializes the late Paul Simison, the volunteer firefighter who founded the race in 1996, ran every race until his unfortunate death in 2012, and truly demonstrated a healthy spirit in his life. Great weather and the tradition of the event brought out an impressive bunch of athletes and exercisers to what is now the Suffield Firemen’s Association Paul Simison Memorial Run, honoring the memorable and admirable man who started this race, now in its twentieth year. And indomitable Nancy Simison, holding with her late husband’s tradition, finished 146th among the 173 finishers, at 45:58.7. Team Paul’s Peeps finished second among the six groups that identified as teams, the first and largest being from Suffield Academy. This popular, well-run race in early June, with a route from the beginning of South Grand Street to Spaulding School by way of Sheldon Street, attracts a great many Suffield runners and walkers, and the full group of runners come almost entirely from a concentrated cluster of towns in North Central Connecticut and nearby Massachusetts. The few outliers this year were topped by a runner from Lauderdale Lakes, Fla. Some years there are runners from the 169 Club, the folks who try to run an accredited 5K race in every town in Connecticut that has one – and there are very few towns that don’t. In fact, the club has successfully encouraged one or two of those failing towns to get with the times and organize a race. This year two 169ers ran in Suffield. The first Suffield finisher, third overall, was Ben Gee, 22, coming in at 18:28.7. The first Suffield female finisher, sixth overall, was Gabrielle Zeller, 17, at 19:47.0. The last recorded finisher of the event was durable Sarah Segar, now 91, who walked across the line at 59:28.6. And her time this year was four minutes faster than last! The full results are available online at BCSportsTiming.com. Proceeds from the Firemen’s 5K are used to support the Association’s scholarships and other benefactions, as well as their annual fireworks display.